Do you know the TV show Come Dine With Me? Well, our (actually not so) little Dubai Food Blogger community came up with the idea to do a Come Dine With Me amongst ourselves. Obvious thing, since we are all foodies, right? You'd expect several separate parallel groups contesting as you'd think this would cause huge interest. Interestingly, just four out of 40-something people committed to it. To some people's defenses, I have to say, they do restaurant reviews mainly on their blogs, or do baking stuff only, or live in Abu Dhabi instead of Dubai (which is 120km away), or are traveling often (as a fact, Dubai residents travel a lot). However, some people chickened out and admitted it openly. In the moment I committed to participating, I related to those who have chickened out. I have had Come Dine With Me dreams or nightmares about every night. Don’t get me wrong, I am very much looking forward to it, but I also feel a lot of apprehension. To be honest, I have never hosted a dinner party before. I mean, we have had friends over for a meal or a BBQ but that’s different. I usually would not buy flowers to decorate the table and they get paper napkins instead of fabric ones. To get down to the point: at this stage, I don’t even own fabric napkins or napkin holders. I don’t have a tablecloth and I only have one vase. I actually have to go and count my plates and cutlery to see if I have five of the same kind. The good news, my fellow diners took a pity on me and put me last in our dinner party round. For those, who (want to) know us Dubai Food Bloggers: it's Sarah from The Hedonista, Sally from My Custard Pie and Sukaina from Lick My Spoon (who is going to have her blog name changed sometime this week). And then there is Jonathan, our non-foodblogging token male (who is known to have taken part (and even won) a Masterchef competition....... Wouldn't you be scared? Apart from tackling my props problem, I am practicing my menu dishes like crazy. My starter includes asparagus, so I bring home all sorts and sizes of asparagus home these days. I am not only cooking my Come Dine With Me starter dish, but make other ones to to get to know the vegetable as best as possible. I made these little gluten-free asparagus tartlets and found they would be the perfect lunch bite in spring/summer: light, fresh, yet filling enough to get you through the afternoon. Since they are little tartlets, they actually don't take long to cook. A lovely seasonal dish. Preheat oven to 200C/400F. Lightly grease small (3-inch) tart molds. In a bowl, sift together all dry crust ingredients. Add olive oil and knead. Add water in small amounts and knead until dough holds together. A good indicator is, when your hands stay clean while you knead. Neither dry flour nor wet dough should be sticking to it. Roll out the dough and cut out pieces big enough to fill each tart mold. Prick each mold with a fork a few times to avoid rising. Prebake for 10 minutes at 200C/400F. Take out and set aside. Meanwhile blanch the asparagus for 3 minutes in salted boiling water, until bright green. Remove asparagus and pout into ice cold water to cool. This will stop the cooking process and retain the color. Drain well and pat dry with kitchen towels. Whisk the eggs. Then combine with goat milk, salt and tarragon. 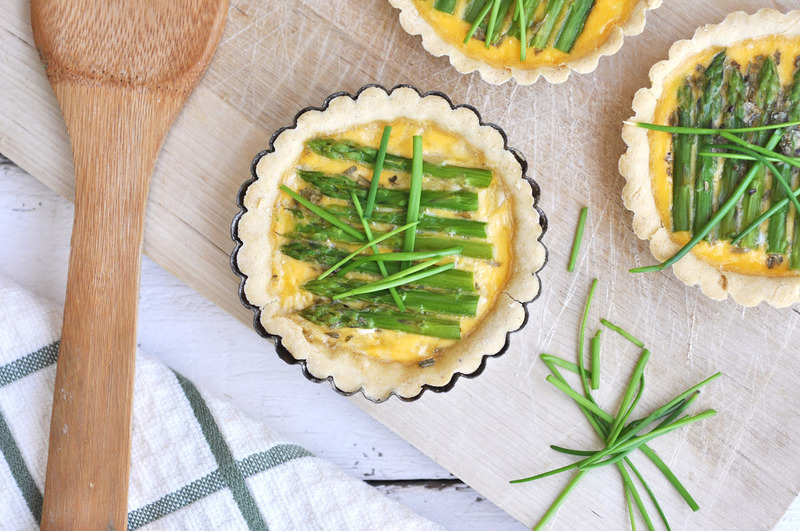 Place the grated Parmesan at the bottom of each pre-baked tartlet. Fill each with asparagus pieces. Gently pour the egg mixture over each tartlet. Bake for about 25 minutes, or until egg has set. Let cool for 5 minutes before taking out of the molds. Serve immediately.